Democratic candidate Andrew Gillum may have lost his gubernatorial election battle in Florida. But one of his young voters can at least take solace from a rib-tickling 15 minutes of fame. 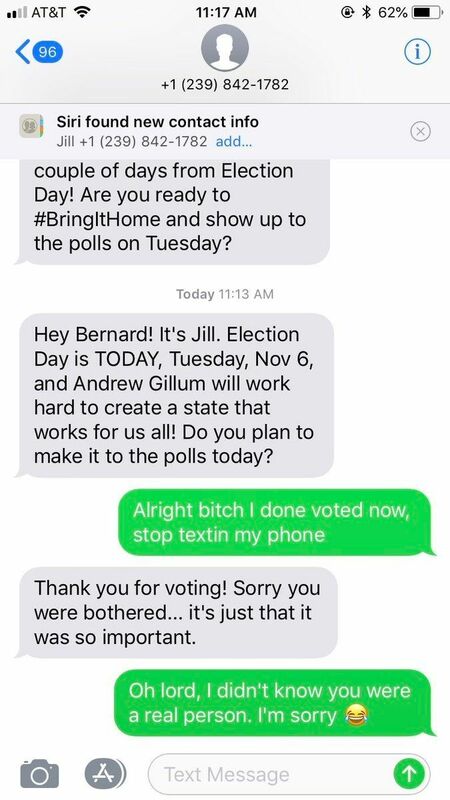 Student Bernard Jennings, 20, has gone viral after he posted a conversation he had via text message with a volunteer promoting Gillum’s campaign. Bernard received numerous texts from the volunteers in the month leading up to the election, but he thought it was an automated system messaging him. ...which resulted in him letting them know he voted on election day in a manner he quickly apologized for. Bernard reached out to Twitter again to ask why no one told him the texts were from campaign volunteers and not bots. Others on Twitter shared similar experiences in response to Bernard’s viral post. Some told their local candidate’s volunteers to “f*** off” under the impression the messaging was automated. People still weren't sure they dealt with real people though. Until a volunteer corrected them. Others were inspired by Bernard’s post to send messages of thanks to those behind the text messages. A volunteer thanked them for their kindness. Bernard studies at Florida Agricultural and Mechanical University in Tallahassee, the same college Gillum graduated from. He said he now appreciates all the texts he received because “it was only for a greater good”. Gillum missed out on the Florida governorship by a narrow margin to Republican Ron DeSantis. Elsewhere in the midterm elections, President Donald Trump’s Republican Party lost its majority in the House of Representatives, but retained control of the Senate.